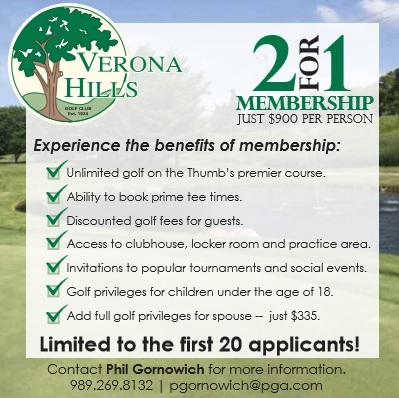 Verona Hills is an 18 hole Championship Golf Course established in 1924. The golf course design takes the golfer through tree lined, rolling fairways with sand bunkers and terraced greens. The Club offers a generous practice range, putting and chipping green, and a fully stocked golf shop. Whether you are an avid golfer or just starting out, our MGA and WGA also stand ready to make your association with our Club an enjoyable experience. I would like to thank you again for your interest in our Club, and look forward to talking to you soon. If you require additional information or would like to tour the facility, please do not hesitate to contact Phil Gornowich at (989) 269-8132 -or use the form below to email us.